When your baby is born they will be given needles to protect them against serious diseases. During the first 13 months the baby will get needles every few months from the GP or Public Health Nurse, they are all free. At 2 months, your baby will have their first visit, and get 3 needles and 1 oral drops. These needles are 6 in 1, MenB, PCV, and Rotavirus. At 4 months, your baby will have their second visit, and get 2 needles and 1 oral drops. These needles are 6 in 1, MenB, and Rotavirus. 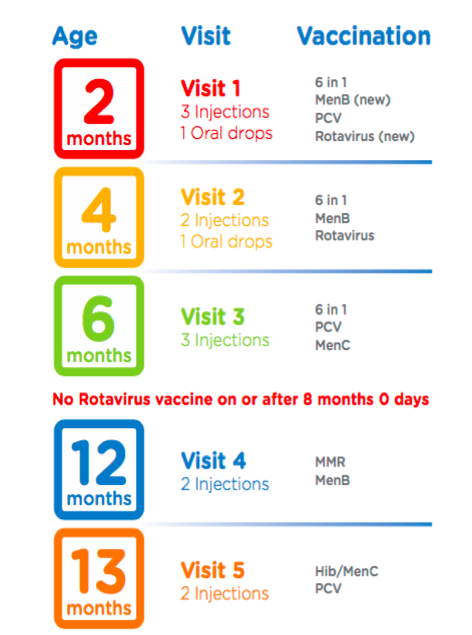 There is no rotavirus needle on or after 8 months of age. At 12 months, your baby will have their fourth visit, and get 2 needles. The needles are MMR and Men B. At 13 months, your baby will have their fifth visit, and get 2 needles. The needles are Hib/MenC and PCV.